No More Waste: How Long Can Breast Milk Sit Out? Keeping Breast Milk on the Counter: How Long Is Too Long? Are you planning on breastfeeding your baby? Do you have questions about safely storing breast milk? Then read on — we have all the answers here. Breast milk is precious and there’s nothing more disappointing than pouring it down the drain. Hence, it’s important to store it correctly. Having a newborn comes with quite a steep learning curve — it can be difficult to remember all the crucial dos and don’ts. That’s why we put together this guide on storing breast milk. You’ll feel confident knowing how and where to store your milk safely. At some point, you may find that you need to pump some of your breast milk. Perhaps you’re going back to work or you just want your partner to be able to feed the baby occasionally. It could also be that you have excess milk and don’t want to waste it. Whatever your reasons, you need to know how to store your expressed milk. There are three basic containers that you can store your breast milk in: glass, hard plastic, or breast milk storage bags. If you’re using hard plastic, make sure it’s BPA-free (source). Plastic and glass containers should have a cap, and not simply be covered with foil or cling wrap. The storage bags need to be specifically for storing breast milk. A regular sandwich or freezer bag is not suitable. Breast milk bags are sometimes difficult to store on their own and can tear easily when unprotected in your fridge or freezer. I used to put the breast milk bags inside a hard plastic container to protect them. Whatever container you decide to store your milk in, make sure that you label it. Write the date and time you expressed the milk on the container. If it’s going to a daycare facility, you will also want to add your baby’s name. Like most liquids, breast milk will expand when frozen. You don’t want to fill the containers all the way full, or they may break as the milk freezes. Also, you should only put one feeding’s worth of milk in each container. If you’re freezing the milk in breast milk bags, lay them flat in the freezer – they’re less bulky than if you set them upright. When they freeze flat, they’re easier to stack and store. If you’re storing your breast milk, the amount of time you can keep it depends on where and how you store it. One thing to keep in mind is that the longer you store breast milk, the more vitamin C it loses (source). If you’re keeping your breast milk in the freezer, it can be stored for up to 12 months, although it’s best to use it within six months. Place it in the back of the freezer where it’s coldest. You can keep breast milk stored in the refrigerator for four days. Be sure to keep it in the coldest part of the fridge, at the back. If you think you may not use the milk, move it to the freezer within three days. When you’re on the go, you may need to store the milk in an insulated cooler. If it contains ice packs and is chilled all the time, the milk can last up to 24 hours. Any time you’re handling breast milk, make sure that your hands are freshly washed with soap and water beforehand. When the time comes to use your the expressed milk from the freezer, you need to thaw it safely. You should stick to a “first milk in, first milk out” rotation, to use up the older bags of milk before they’re no longer viable (source). You shouldn’t thaw breast milk in a microwave. This can create hot spots that may burn your baby’s mouth and throat. It could also destroy some of the nutrients in the milk. The proper way to thaw the milk is to move it to the refrigerator overnight, not at room temperature. Another option is to hold it under lukewarm running water until it’s thawed. Or, you can place it in a basin of hot tap water until it’s thawed. Once you thaw the milk, it can be kept in the refrigerator for up to 24 hours, but should not be refrozen. The biggest question you may have about storing and using your breast milk is the amount of time you can leave it out at room temperature. There will be times that you’ve pumped or thawed milk that your baby didn’t drink right away. Freshly pumped milk: Can sit on the counter for up to four hours before it needs to be refrigerated or frozen. Refrigerated milk or frozen milk that has been thawed: Can sit on the counter for up to two hours before it should be discarded. 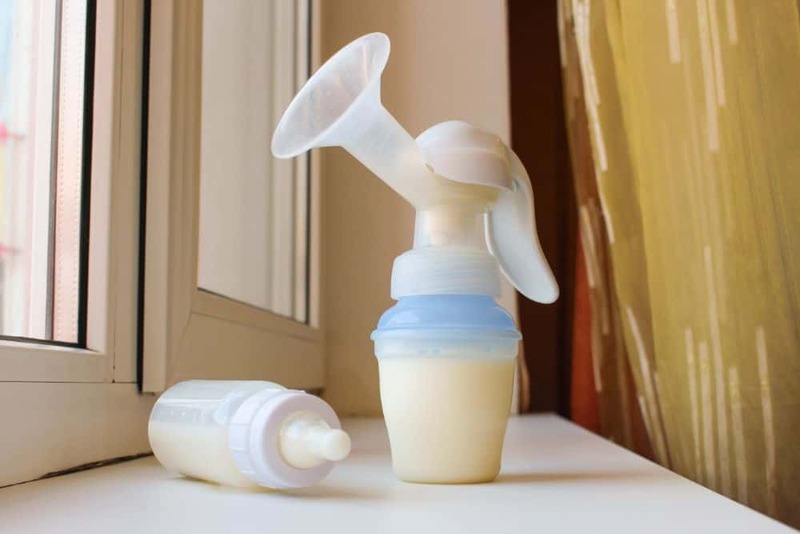 Milk left in the bottle after a feeding: Should be finished by the baby within two hours, after which the remaining milk should be discarded. You can feed your baby breast milk at room temperature or even a little below. It isn’t necessary to warm it, but some babies prefer it to be warm. If your little one likes warm milk, you can use a bottle warmer or place the bottle in warm water to heat the milk. One thing you may notice when you’re storing your milk is that it separates. This isn’t anything to worry about. Give the bottle or container a little swirl to mix it back up again. Every mom knows that a fed baby is a happy baby, and storing your breast milk is just another way to keep your baby fed, full, and healthy. Storing milk will be easy now that you know you can keep it in the freezer, fridge, and even in an insulated bag while at work. Milk left on the counter can be fed to your baby within a few hours so it doesn’t go to waste. If you have any great methods for storing your milk, tell us about them in the comments below. Also, if you know another mom who wants to know about the logistics of milk storage, share this article. We love helping moms on social media!